This is what laundry day looks like when you have a wardrobe of handknits. Someday I hope to not need the washing machine at all! Today I thought I'd show you my knit-washing process. It starts in the soaking room, a.k.a. the guest bath. Then I roll up the sweaters and stomp on them, "I Love Lucy'-style. Finally, I bring them up to the blocking room and lay them out under the fans. I put the ceiling fan on high and then set up a desk fan to blow directly on the spare bed/ blocking area. The sweaters should be dry by the morning; now I just have to decide what to wear tomorrow! So I've been a bit quiet on the blog lately. I think there are two main reasons for this; 1.) March Madness took some of the wind out of my blogging sails, and 2.) umm... spinning!!! It finally clicked and now I am a woman possessed! I'm quickly spinning my way through my small fiber stash. 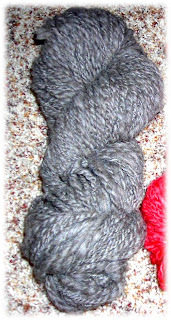 First there was the gray Corriedale from Susan's Fiber Shop. Really uneven and chunky, but it does look like yarn. I found this first batch of roving to be really difficult to spin and a bit frustrating, but I stuck with it. Next I spun a wool top from the Iowa Sheep and Wool Festival. Still uneven, but I could probably knit it on US 10 needles into a cool scarf or something. Then I went to Serendipity Yarn Shoppe for a Spin-In with Abi, from High Prairie Fibers. I learned a ton in the short time I was there and my next yarn actually looked like "real" yarn. You know, the kind people pay money for. Next on my wheel is Louet Northern Lights 100% Wool Top Handpainted Pencil Roving in the Caramel Apple colorway. In the last two days, I've received some pretty interesting mail. First, yesterday this showed up! Are you sensing a theme here? It seems farm-themed knitting is all the rage. Click here for the cover project, the "Heartland Road Trip Tote Kit". I've been drawn to pastoral scenes for as long as I can remember. I'm pretty sure this was started with a smocked dress I had when I was really small. The dress was embroidered with a farm scene and I loved it! Now with the recent inspiration, I'll definitely be casting on for some new projects soon. There are a few more projects that have caught my eye in the same theme. From the Fall/Winter 2008, Knit1 Magazine, the #04 Rainy Day Fingerless Gloves. 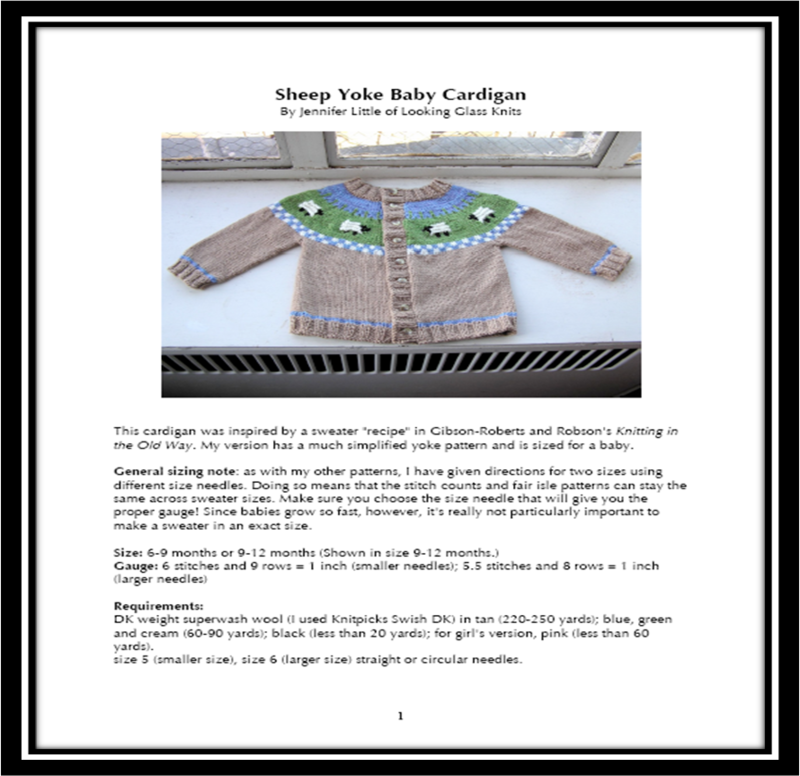 I've also been seeing some very cute versions of the Sheep Yoke Baby Cardigan on Ravelry. This adorable FREE pattern was designed by Jennifer Little of Looking Glass Knits. 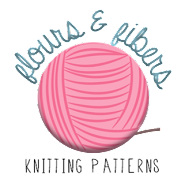 French Press Knits (one of my favorite bloggers), made an adorable version for her newborn daughter to wear home from the hospital. 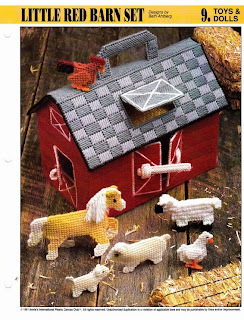 And finally, the other day in anticipation of getting Spud and Chloe at the Farm, I was searching Etsy for some plastic canvas patterns. I got the idea to make a plastic canvas barn to house all the knit farm animals in. I really like the idea of having an enclosed space to store all the toys. Here are a couple of the patterns available on Etsy. 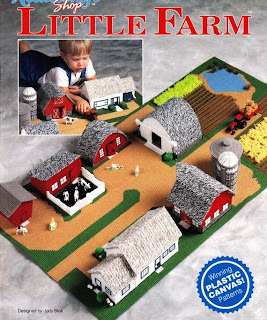 This barn set is really close to what I was imagining. I would probably make a few changes, but the pattern might be worth getting. This is not what I was originally looking for, but it's incredibly detailed. After seeing this pattern, I found a ton of really cute toy plastic canvas patterns. My grandmother used to craft us all sorts of plastic canvas projects; toys, ornaments, purses, and the ever popular tissue box cover. My mom's sister also used to make plastic canvas placemats and coasters for everyone in our family. These sweet projects hold a lot of fond memories for me, and I'm excited to learn a new craft soon, in memory of my Aunt Sandy and in honor of my Grandma Elaine!